For years, I cross stitched every spare moment I could find. I loved to create wall hangings and had them displayed all over the walls of the entire house. 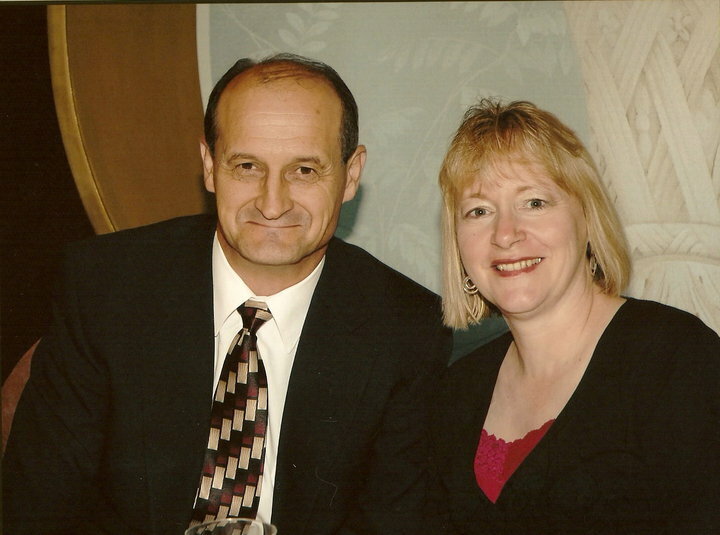 Finally, my husband, Charles, (pictured here with me) said that either we were going to have to buy a bigger house so I had more walls to cover with my masterpieces or I was going to have to get a new and different hobby. Wow, did I take that advice and run with it. Since that day, I have knitted without stopping. I always have several (okay, I will be honest. . . I have more than several) projects going at any given time. I always have my knitting bag handy. Now, instead of decorating walls, I am decorating my home, my family, including Charles, as well as myself. I will never run out of projects or places to display them. Knitting is the perfect hobby! Well, it has happened again. Marilyn is expecting lots and lots of yarn and it is all going to be delivered on a day that I am not working at Yarns! She even warned our delivery man that he would have a huge load for us. Connie Jo helped her reorganize all kinds of yarn racks to get ready for this delivery, even putting more stuff in the sale bins. There is just nothing in this world as exciting to me as getting out the ol’ box cutter and opening a huge box of yarn that I helped choose at Yarn Market! The colors just jump out of the box and the skeins are just waiting to be loved! The gang who knits/crochets during Social Knitting time have been known to dig through boxes and choose what they want before Jane gets all the new yarn recorded in the computer! I am going to miss all this fun! Drop in and check out the new yarn, but, for Pete’s sake, leave some good stuff for me. Even though I love to try new recipes, I tend to keep falling back on the same old favorite dishes! In the same way while I love to try all the fun new yarns and fibers, I still love to knit with the “old favorites”. I just completed a sweater (shown above) for my granddaughter, Melody, using Ultra Pima Cotton yarn and I am making the hoodie in Kitty’s class out of Vintage. The sweater I just started for my granddaughter, Audrey, is made using Heritage Sock yarn. Encore is another yarn I love for baby, children and blanket projects. All of these yarns are a joy to knit with and my daughters love the wash-ability of these yarns. So, while the famous song may say “These are a Few of My Favorite Things” . . . for me the song is “These are a Few of My Favorite YARNS”! Don’t you just love a party? I especially like a party with those I want to be around. Our Christmas in July party on August 3rd was just plain fun. You just can’t beat a place with lots of knitters and crocheters with lots of yarn with fun food thrown in for good measure. Thanks to all of you who dropped by. Photos and names of winners of all the drawings will be forth coming! I (as in Nancy) am in Florida and had the pleasure of teaching my 14 year old niece, Jackie, how to knit! That just makes for a perfect vacation with the extended family! With so much assistance from all of my grown children, YARNS is pleased to announce the beginning of our new blog. It is our plan to update our blog at least each Friday but, who knows. When it comes to sharing our love for yarn, knitting, crocheting, patterns, books, etc., we have lots to share. 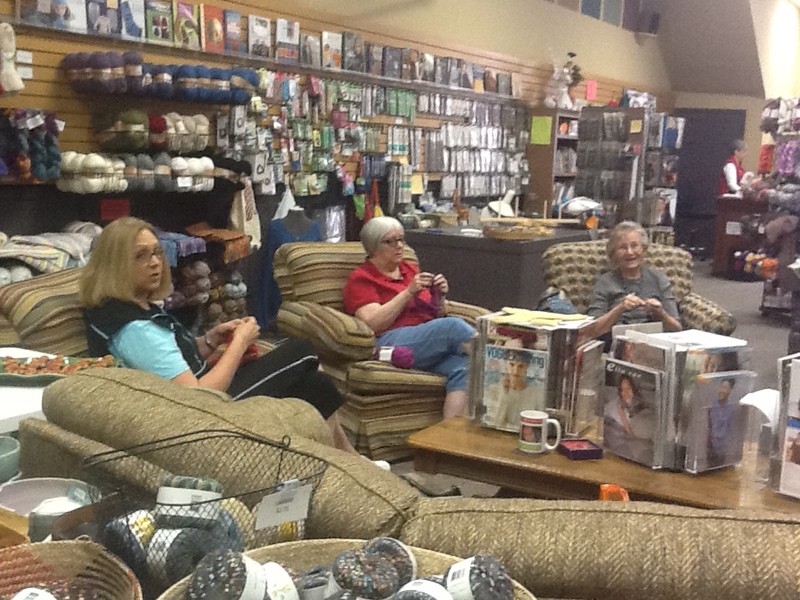 So, drop by often and see what’s happening at YARNS!